Abstract from Yalqut Yashar by Isaac Samuel Reggio. הדבר אשר מל יהושע. נדפס בילקוט יש"ר להכותב הזה. Abstract from Yalqut Yashar by Isaac Samuel Reggio. Amsterdam, c. 1850. 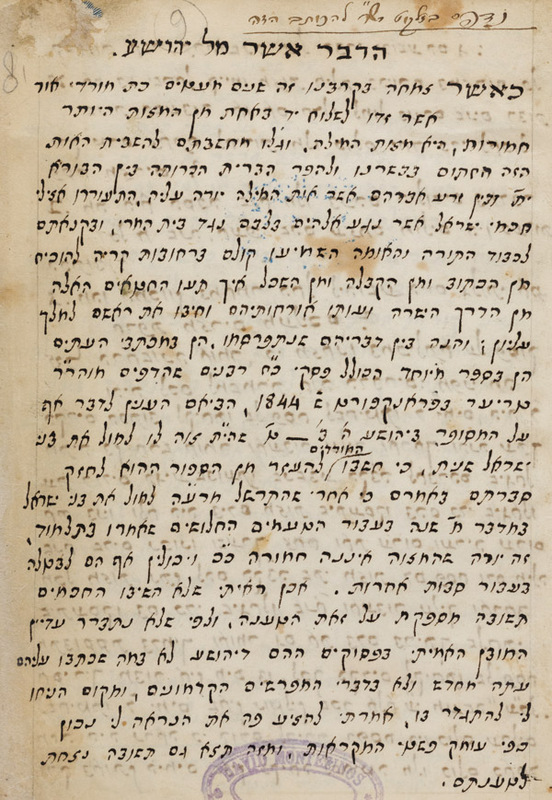 On top of f. 1r a notice is written in Ashkenazic cursive writing that the text has been printed in Yalqut Yashar (Goritzia, 1854) from this manuscript. Hebrew / Paper / 16,8 x 11,2 cm. /  ff. / Neat Sephardic cursive writing (probably autogr.) / Title written in square characters on top of f. 1r.